The Club have, this morning, been saddened to learn of the death of our former player Jackie Foster. Jackie was a member of the team in the mid 1980’s, he was a fundamental member of the side that won the Northern League title in the 1984/1985 season under manager Brian Newton. 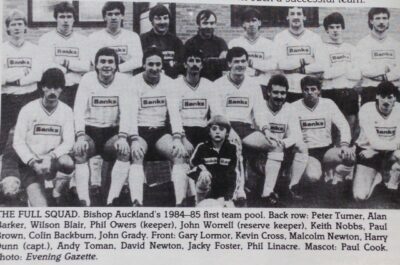 The team were also won the Durham Challenge Cup that year. 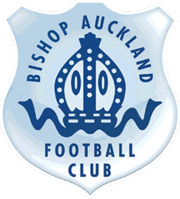 Jackie also organised and coached a Bishop Auckland Juniors side in the mid 1990’s. Our thoughts are with Jackie’s wife Ann and their sons Paul and Lee. The Club plans to dedicate our FA Cup match against Ossett Albion on Saturday September 3rd to Jacky when we will also hold a minute’s silence before the game in his memory. Great man & great player will be missed by so many. An honour to have known & played with him. Lovely man and class player, great team to be involved in. Bit biased but think this one of the best squads Bishops ever had. Privileged to have been apart of it. Would be great if Harry, Gary and former team mates could come to HP sometime as our guests and reminisce on those great days! Very sorry to hear of Jackie Foster’s passing. I remember playing in some great games against Willington in the early seventies, with Jackie in their team. Very reliable, a good left sided player and a solid defender. RIP Jackie. Please publish my email address. I would like to communicate with any former player or supporter who may remember me. Thank you. If anyone would like Barrys email address then please go to the contact us page and request it. Just returned from Jackie’s Funeral – Turn out Fantastic – Just as expected. Thoughts with Ann who I met this week. I am the most fortunate Manager in the world. Jacko played with me and for me at Willington, Crook and Bishop Auckland.